And how does a father instill these qualities in his son? Beginning with a biblical perspective of manhood, this series shares a unique approach to shaping a boy into a man. Complete with rite-of-passage ceremonies to celebrate a boy’s rise to manhood, as well as creative ideas a dad can draw from to better connect with his son, this series is as insightful as it is practical in raising a boy to be a chivalrous, godly man. 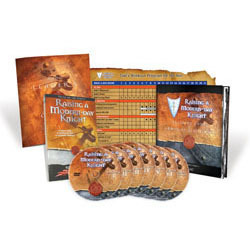 Part of the LifeReady® Series, this training kit is designed for a small group of dads whose sons are ages 6-10 and who are serious about empowering their sons to be successful in life. Dennis Rainey hosts FamilyLife Today®, a nationally syndicated broadcast bringing help and hope to nearly 1000 communities in the U.S. Along with his wife, Barbara, the Raineys co-founded FamilyLife®, a ministry committed to helping marriages and families survive and thrive in our generation. Dennis and Barbara live in Little Rock, Arkansas. They have six children and an impressive number of grandchildren.